Recently, Piper and Londyn (my two littles) discovered the great joy of playing together in Piper’s room. The whole twenty minutes of pure silence, kids nicely playing together, is the perfect time for this mom to warm that cup of coffee I never finished this morning and sit. At least for a few minutes, uninterrupted. A couple of months ago, the normal twenty minutes of play was extended. Not by my doing, but the kids seemed to be really enjoying their time together. Check-in or sit and savor the last few drops of coffee? As any practical mom would do, I raised my voice enough to be heard from the bottom of the stairs, “Are you two okay up there?” Silence. I put down the coffee (it was hard) and walked upstairs. I quietly peeked down the hall and saw her, covered, mouth full of pink paste. Londyn had successfully broken away from playtime with Piper, wondered into the bathroom, and grabbed the bottle of kid-friendly “natural” toothpaste. The bright pink color and strawberry-flavor was just too appealing for a two year-old. And when anything is that appealing, much like chocolate, the only logical thing is to attempt to eat and cover yourself with the entire tube. I caught her just in time, most of the paste covered her body and the sticky hand-printed walls. I’m sure she ingested a small amount too. The idea of a child loving toothpaste so much that she viewed it as an edible treat, candy, terrified me. I’ve been making and using homemade toothpaste for over a year. I’ve noticed an incredible difference in my dental health. Ditching the commercial paste has proven to be a wise decision. My kids are less than fond of my homemade concoction. The taste is “too hot” for their liking. (“Too hot” is Piper’s way of saying a food is too salty.) With the desire to make brushing teeth an enjoyable experience, I’ve been buying a popular “natural” brand of toothpaste: pink, strawberry-flavored, and super kid-friendly. Never giving thought to homemade “kid” toothpaste until Londyn’s scary toothpaste adventure. Today, my kids use homemade toothpaste. A recipe very similar to my peppermint paste, but made kid-friendlier. So, what’s different? In the kid-friendlier recipe, I omit the salt and use less baking soda, reducing the salty taste. My kids aren’t a fan of peppermint, so I turn to a kid-friendly and safe essential oil, sweet orange. The addition of stevia adds a bit of sweetness, just enough to make teeth-time enjoyable. A recipe I can feel good about my kids using without the temptation of viewing toothpaste as edible candy. 1. Transition Slowly. My kids weren’t keen on the whole cold-turkey thing. I started putting a small amount of homemade paste on their toothbrush, followed by the commercial paste on top. Slowly, every couple of days, I decreased the amount of commercial toothpaste, adding more homemade paste. Eventually, the commercial paste was no longer needed. They also stopped trying to eat or “drink” the toothpaste once the transition took place. Toothpaste is now viewed a something we use to brush our teeth, not a treat. 3. Make it Together. Just like real food, getting your kids involved in the process of creating is always a win. This recipe is simple enough kids can assist in the making. 4-10 drops sweet orange essential oil Lemon or Peppermint are also an option if that's more appealing to your kids. In a medium-size bowl, combine the coconut oil, baking soda, and clay. Mix thoroughly. Store in a jar or for squeezable toothpaste, use these. Note: When mixing bentonite clay, please use a wood or plastic spoon. Bentonite clay should not come in contact with metal because it deactivates the clay. The consistency of this recipe can vary depending on the temperature where the toothpaste is stored, due to the nature of coconut oil. This toothpaste isn't meant to be stored long-term, so I recommend making small batches frequently. I’m sure someone will ask about baking soda being abrasive. I personally, after much reading, feel safer using baking soda than commercial toothpaste. It’s much less abrasive than commercial toothpaste, even the organic options. You can read more information and view a chart here. Also, if you’d like to skip homemade toothpaste and purchase a “cleaner” store-bought option, I love Nature’s Gate or Earthpaste (both are available at health food stores, or online). This recipe looks awesome! I want to get some sqeezie tubes and make it! I was wondering if there was a substitute suggestion you could give me if I’d like to use your recipe, but have an allergy to coconut. I’m finding a lot of difficulty searching for healthier alternatives for myself and my family due to quite a long list of intolerances I’ve developed. Any guidance/help/motivation is greatly appreciated!! I love reading your blog among various others out there and hope to be able to improve the quality of life of myself and the people I care about. Thanks so much! Hey Stephanie, I haven’t found a way to make homemade toothpaste without coconut oil :(. If a homemade version isn’t available (that’s coconut-free) then purchasing Redmond Clay’s toothpaste would be the next best option! You could try omitting the coconut oil and using it as a dry tooth powder. I have made homemade tooth cleanser this way and it works fine. Just wet your brush before using so that the powder sticks. Don’t know how kids would react to it but it might be worth a try. Hey Lindsay, I think that may work with the dry ingredients in this recipe. Let me know if you try it! i don’t see why she could not us a good olive oil or even a avocado oil instead of coconut oil. With oil cleansing of the teeth and gums u swish with is usually olive oil just use more backing soda to thicken it. I could be wrong but that is what I would use and keep it in the fridge because it thickens when it is cold. If I’m wrong pls let me know. And I was also thinking strawberry extract which u could probably get at whole foods to add a couple of drops to make the tooth paste better for kids. And Strawberries are a natural whitner. Kari-Lynn, I haven’t tried adding a different oil, but if you do let me know how it goes! I think a natural strawberry extract would be a great addition. I’ve been making mine with palm oil…the funny orange colored stuff that you have to be sure is harvested sustainably, etc. It looks orange in the sink but didn’t stain my teeth or anything and they feel just as clean as when I originally used coconut oil. I tried olive oil and it…ugh…it was bad. It made my mouth smell and feel funky for the rest of the day! How long would you say this is good for? Hey Sarah, As long as water isn’t introduced, I usually keep it for 2-3 weeks. What a great recipe! My little one would love this. Orange essential oil is her favorite! How awesome! I especially love the squeeze bottle as nerdy as it is! 😉 We’ve been using the kids toothpaste from Young Living, but will definitely give this one a try! Hi Myra, I’m totally obsessed with the squeeze bottles too ;). Enjoy! I love the idea of getting your kids to help. My kids love to help with making anything so maybe they will enjoy using it more. I like the orange idea too. So the peppermint doesn’t really help with the cleaning aspect? Orange oil can actually help whiten teeth! Just a fun fact I thought I would add! Awesome, Jamie! Thank you for sharing! Is there a alternative for coconut oil. I have a child with a tree nut allergy, which includes coconut. Moriah, I bet you could totally use rendered lard for a pastured pig. I didn’t think you could use bentonite clay internally. I know my kids would swallow accidentally. Can you share with me why you think that’s ok to ingest? The website I wanted to buy from states only for external use. Thank you! I’m beginning the process of ridding our beauty cabinets of chemicals and looking for a good toothpaste! Hey Sabrina, Great question. Personally, the swallowing is what really concerned me with the commercial pastes. They are so tasty my kids wanted to swallow along with all the chemicals. You can leave the clay out if it concerns you. You’ll still have a good toothpaste for cleaning. Here’s a little bit about clay and all it’s uses: http://wellnessmama.com/5915/the-benefits-of-healing-clays/. Also some purifying qualities of clay: http://www.foodmatters.tv/articles-1/bentonite-clay-a-safe-and-effective-detox-from-radiation-build-up. I personally wouldn’t internally take clay on a regular basis in large amounts (although some people do and I’d make sure the source is a very secure one, if you decide to follow that practice), but the minute amount in the toothpaste is very safe, even if the small amount is consumed. I’ve also found now that toothpaste doesn’t taste like candy my kids don’t swallow it like they used to. Leaving me feeling much better about the little that may be ingested vs. the commercial ingredients. You can also check out Redmond Clay, same clay, just a different brand, which many ingest. I heard that Bentonite clay absorbs the chemicals found in plastic and that you should only store it in glass, what are your thoughts on that? Hey Ruth, Yes, it’s true. It’s best not to store clay (that’s been activated, AKA wet) in plastic over an extended period of time. This recipe makes about 2 oz (a bit less), so between two kiddos it’s used rather quickly (not stored over an extended period of time). Also, I love that these tubes are silicone. If you do store it in plastic, for a short time period, choose the best you can find. I’ve been wanting to use the GoToob for my homemade toothpaste. I am wondering if you wash them out between batches or simply refill the tubes. I am worried about the coconut oil residue from previous batches going rancid after time if I don’t wash out the tubes. Thanks! Hi Gloria, I wash the tubes in between new batches of toothpaste. I’m concerned about water or anything “extra” with kids that might get into the tubes. They wash well. I’ve found a bottle brush really helps. Thank you, Ron. Can’t wait to hear what you think of the toothpaste. Would diatomaceous earth work in place of the bentonite clay? Hi Marianne, Diatomaceous Earth would work great in this recipe. Can I make this without the clay? maybe add calcium powder instead? Hi Lolo, I think calcium powder would be a great substitute for the clay. I am looking forward to trying this! My little man dislikes sweet tasting things so the previous kids toothpastes we have tried are out. He would probably like a saltier option. But any recommendations you have on ingredients that would steer clear of sweetness are appreciated! Hey Brandy, I would leave the stevia out of the recipe. It’s added to sweeten the toothpaste. You may also want to leave the essential oil out. The toothpaste alone is salty, but if he doesn’t like the salty bland taste then orange or peppermint essential oil can be added. I love that it has coconut oil cause it is way good for your teeth and has about 100 more uses! I love the little bottle you stored it in. I wonder if there is a vanilla essential oil that i could add with the peppermint! Katie, That sounds great. Let me know how it goes. Can I use a dry powder truvia or xylilot? I am new at making my own homeade beauty products. I love it!! Hey Gina, You can sub either one for the stevia. Enjoy!! We keep bees and harvest our own raw honey – could I use that in place of the stevia or would it not be good for toothpaste? Looks like a great recipe and excited to try that squeeze bottle! I would love to keep bees! That’s awesome to have your own honey! Stevia and honey are very different, so honey won’t work for this recipe. You can leave the stevia out, it’s just added for a bit of sweetness as many kids are transitioning from the store-bought paste (that’s very sweet) to homemade. Actually, raw honey is great in homemade toothpaste! It’s anti-bacterial, viral, fungal, septic qualities make for a wonderful additive. I too keep bees and we love our homemade toothpaste with a little raw honey in it. I have also brought this up to our dentist who completely agreed. He is fairly pro-natural about things (although he is a standard practice) and he thinks honey and things like baking soda are great to use and dislikes average toothpastes for what they contain. I understand you’re going for a far less sweet alternative to commercial toothpaste, but if your family likes it, go for raw honey! Also, thank you for your ratios provided. I used them to help establish our own recipe. I sometimes add calcium powder I make ourselves from sanitized eggshells from our free-range eggs, and activated charcoal to my husband and I’s paste. Thank you for sharing, Rosie. I didn’t know that great info. So what do u need just for the cleaning of your teeth? Hey Anna, You need everything except the stevia and orange (which are for flavor). This is great–thanks so much for the recipe! One quick question: when I tried the recipe, my kids liked the taste, but the toothpaste was very difficult to squeeze out of the tube–it ended up really thick (I had this same issue when I made the adult version for myself). Do you have any ideas why this might have been? Any suggestions on which ingredient I could add more or less of to make it more squeezable? Yours looks like a nice consistency in the photo. I think the thicker consistency is coming from the coconut oil since it’s winter (and depending on where you live and how cold it is, your coconut oil may be rock solid!). You can try warming the toothpaste in your hands by holding the bottle. That may help warm and loosen the coconut oil. If that’s not the issue, then adding more coconut oil may help, add a tsp at a time. You can also try adding 1 tsp at a time of boiled or distilled water to keep the toothpaste a nice, squeezable consistency. During the summer you’ll probably have just the opposite problem :). Hope that helps! I made this for my kids – loved it – but we have the same problem with it being super thick. Wisconsin winter = hard coconut oil. I’m going to be making another batch soon & will try the water trick this time time around & see how it works! I read a similar recipe that added sesame oil (??) but I would rather just try water. Love those tubes, by the way! I bought a 3-pack and we were able to fill 2 completely with a little leftover. Everyone picked their own flavors. Only other problem we encountered was that my oldest must’ve knocked his off accidentally & we believe it landed in the garbage! 🙁 Not a cheap oops, by any means! Firstly I must say that I love your blog! I have made a bunch of your recipes and find that you are becoming my go-to for DIY even more than wellness mama and momypotomus! So, having said that, I finally got around to making this toothpaste and b/c it’s summer it’s super runny that it’s really messy. I put it in the fridge and then it won’t squeeze of of the tube. How do you store this in the summer? Also, have you had any issues with your drain clogging? Thank you so much!! I’m so glad you’re enjoying the recipes! We live in Florida so we keep our house air conditioned all summer long (around 73 degrees). The cooler temperature means I don’t have any issues with the coconut oil, but this would certainly change if the temperature in our house increased. My best tip is to increase the dry ingredients during the summer. You may also want to try whipping the toothpaste with a mixer–this may help; however, I haven’t tried this as a solution for warmer temperatures, only during the winter. I haven’t had an issue with coconut oil in our drain, but since our temperatures don’t change much it’s not a concern. If I lived in a colder environment, with freezing pipes, I would definitely spit the excess toothpaste in the trash before rinsing. I’ve read that you shouldn’t spit coconut oil down the drain. I know the toothpaste isn’t as much as used in oil pulling, but do you worry about your pipes? Hey Shannon, That’s a great question. I live in Florida, so don’t worry much about this because we don’t experience cold (and cold pipes). Fractionated coconut oil may work for those that worry about the drain/pipes issue, particularly in the winter. But, you’d need to use less and the consistency will be much runnier. Thank you for the recipe! Quick question, do you think the orange oil has citric acid in it? Obviously the juice would have the acid, but I wonder if the essential oils from citrus fruits do also? Hey Lana, You’re welcome! A pure essential oil (like orange essential oil) shouldn’t have citric acid added. Have you tried to use xyletol in place of the stevia? I’m curious about the liquid versus the granules. Kristi, I haven’t tried using xyitol in place of stevia, but I think it would work well. I’m not sure of the ratio you’ll need. We use a recipe very similar to this and love it, but with one exception. I have a terrible time trying to keep the toothbrushes clean! They really gunk up with the clay and the kids especially seem totally unable to get them clean after brushing. Does anyone else have this problem or a good tip?? Hey Ashley, I’ve also noticed the clay combined with coconut oil can build up a bit on toothbrushes. Every couple of weeks I soak our toothbrushes in a solution of 1/2 hydrogen peroxide and 1/2 water for a few minutes, then rinse the toothbrushes out very well. I’ve found this really helps to keep them clean. Other readers may have some good advice and tips too :). Do you spit this in the sink or trash? I am concerned about the coconut oil building up and causing problems in the long run. Hey Nell, We live in Florida (our pipes don’t get super cold and freeze), so we spit this in the sink. If you live in a location with freezing temps, I would spit this in the trash. If I am reading your recipe correctly, this is just a recipe for toothpaste, right? The only thing making it a “kids” toothpaste is the flavor? I see the ingredient are the same with this one and your adult toothpaste so I am assuming its just the flavoring that changes it from “adult” to “kid”. Hey Christine, This recipe isn’t as salty as the adult version. That’s the biggest different. I have been making my own toothpaste with a very similar recipe. My son is 16 months and I currently only brush his teeth with water because of my concern of him swallowing the toothpaste, not to mention I use peppermint, and would prefer not use on him yet. Is your recipe safe for such a young age? Hey Sabrina, I starting using this recipe on my daughter’s teeth when she was 18 months old. I think the safety issue is a decision each parent needs to make, whether it’s homemade or store-bought toothpaste. What’s the shelf life for this? Hey Casey, As long as water doesn’t come in contact with the toothpaste, this will last about 6 months. Is the real salt nesasary? Hey Olivia, The real salt contains important minerals (something table salt doesn’t have) which is beneficial for teeth. It can be left out, but the toothpaste won’t provide the same mineral benefits. Hi! I’m looking for homemade toothpaste for my baby. Would you recommend to add all the ingredients? Hey Jermaine, I usually reserve the use of toothpaste on my children’s teeth until about 18 months. Before then we simply brush their teeth with water and a toothbrush since they want to swallow everything as a baby. I am so happy to find your recipe. I have never been fond of the taste of toothpaste because the flavor is always too strong. Now I can have it My Way! Thanks so much. That’s great, DonnaT! I’m so glad you found this recipe :). Enjoy!! Thank you so much for your notes and the recipe. I’m looking forward to trying this. Before I buy the supplies, I’d like to make sure that I understand the difference between 1) pure stevia, 2) stevia extract, and 3) stevia with glycerite (like the Now brand, for example). I tried internet searches, but it seems that many people are confused. Thanks for your help! Stevia has become one of those buzz words that companies like to market, but the actual product can be filled with a million (okay, more like ten) different additives. When making a stevia choice, I highly recommend reading the ingredient list and finding a brand with only 2-3 ingredients max. A bottle with only 2-3 ingredients (not added sweeteners) is the best choice. The actual labeling of stevia is a bit confusing, but sticking with the ingredient label will speak for the product. I cannot wait to try this!! I do have 1 question. My children are 3 & 5, and have had dental problems pretty much since their teeth came in. We made our own mouth wash and have been using it. I’ve tried oil pulling (at least a 5 year old tolerant version) for a few days. But the dentist said they need fluoride. Can I add fluoride to this? I feel like that’s a dumb question because I also have no idea how you buy fluoride lol. Thank you!! Hey Brittany, Our county includes fluoride in the water system (we also use a filter system), so we try to avoid fluoride in toothpaste. I’m not sure if it’s possible to DIY fluoride in toothpaste. I know some dentists provide fluoride treatments, so maybe that would be an option? just use 2/3 cup baking soda, 10-15 drops of peppermint oil or any essential oil that you like, i.e. sweet orange or spearmint, a teaspoon of fine sea salt if you would like and filtered water to make it as thin or thick as you want! I hope that helps! Thank you for sharing, Rebekah! I’m new to essential oils but I’ve been told they must only be used in glass. Is this a big deal? Hey Kate, For long-term product storage it’s best to use glass since essential oils can “eat” the plastic. The tubes I use are made from silicone. Hey so my twins are 2 and don’t understand the concept of spitting yet, (at least their toothpaste haha! )have you found that it’s ok for kids this age to ingest a small amount of this toothpaste? Hey Brandy, The only ingredients that would concern me with being swallowed on a daily basis are the clay and essential oil. In that case, I would probably try sticking with the remaining ingredients. Since they are so young they may not notice the difference between flavored and non-flavored toothpaste. Hey Shelby, Personally, I haven’t experienced any issues from the small amount of toothpaste that I spit down the drain. Now, cooking with coconut oil is a different story since I don’t want to dump a bunch of oil (just like bacon fat) down the drain at once. We live in Florida, so our pipes don’t get cold or freeze. I wonder if the issue applies mostly to people living in colder temperatures? I’m not a plumber, so that’s my guess ;)…I don’t have any solid information to base that opinion on. Ok, I made the toothpaste! I’m having 2 problems, 1 within about 3 days the toothpaste became so thick and hard it would not squeeze out of the tube. I had to open the cap. Also, I found chunks of coconut oil in the paste. I’m not sure if I didn’t mix it well enough before adding all ingredients? I also noticed when I first used it it seemed like dirt was coming out of my mouth (obviously the clay) but as the toothpaste got harder when I brushed my teeth the clay was less obvious..
Having said all that, I do feel my teeth are so much cleaner. I was just hoping to tweek it a little in hopes to get my little ones to use it. Any suggestions?? Thank you so much for all your time and effort in these awesome healthy product!! Hey Dawn, My guess is that the toothpaste is super hard due to the cold weather (if it’s cold in your home). One way to solve this may be to add a bit of water, but then you’ll need to use the toothpaste quickly since the water will reduce the shelf-life. The coconut oil chunks may also be due to the cold weather, and maybe they weren’t fully whisked out before adding the toothpaste to the tube. I would try adding water to the toothpaste and see if that helps–add 1-3 tablespoons of warm water at first (preferably distilled or boiled tap water…boil for 15 minutes). Hi. I know that this post is a few years old but I just recently found it on Pinterest. I have a question since it is an older post. I use to make my tooth soap on a regular basis for years. The recipe I used is very similar to yours. I recently stopped for a round two years now. My teeth were very healthy and my dental appointments were always great. But that was also because my original dental hygiene was already good. The reason why I stopped making my own and went back to NOW FOODS brand was because I noticed that my teeth were not as white as they use to be using the NOW FOODS brand. My teeth were in good health but began to look grey. Now that you’ve had a few years to test your recipe, have you noticed any effects of greying? I would prefer to go back to making my own but being vain about my smile, I don’t want to risk the chance of my teeth not being pearly white. Please let me know. Thank you! Hey Diana, I go between using homemade toothpaste and purchasing Earthpaste. So far I haven’t experienced an greying. At least, if there is graying, it hasn’t been dark enough to really tell. I know activated charcoal can help to whiten teeth, so I wonder if adding a bit of the charcoal to homemade toothpaste would help whiten your teeth? Hey Chas, Yes, that’s the tricky part! I’m glad you got the toothpaste in. I’ve used a small funnel and chopstick or skewer with good success, although it still requires a bit of patience. Maybe try a pastry bag? 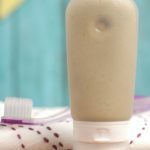 I just found this post and like your recipe, but wanted to know if you thought it would still be a good alternative to commercial toothpaste if I omit the bentonite clay and stevia? I realize it won’t be as sweet, or remineralizing but I’d like to avoid those ingredients. And if so, do I need to make any other adjustments to the rest of the ingredients? I also considered adding cocoa nibs ground up in our coffee grinder, but wasn’t sure if that would be too abrasive. Any input would be greatly appreciated. Thank you!! Hey JessicaB, I think you could leave out the clay and definitely the stevia. You may need to decrease the coconut oil a bit. I personally wouldn’t add cocoa nibs to the toothpaste. Mine came out very salty. I followed the measurement of the ingredients. Is it the baking soda that makes it salty? Hey April, Yes, homemade toothpaste is salty. It took a while to get used to in the beginning. You can reduce the salt and baking if you’d like. Our kids didn’t like the change but our teeth look so awesome with the baking soda. Just thought you should know that GoTubes, or any silicon tube for that matter, should not be used with oil based products, including coconut oil. The oil reacts with the silicon, and will impart a strong silicon taste to the oil. Likely you never noticed the taste because of all the saltiness and essential oil flavoring, but I thought you should know. Try it out for yourself … put pure coconut oil in your tube for a while, then have a taste. Also, the baking soda is really not needed, especially for kids that don’t like the taste. Yes I know that it’s all the rage, but the clay is more than sufficient to clean your teeth. Earthpaste for example is essentially just bentonite and water. Why do they use that particular clay you might wonder – well they happen to own a particular bentonite deposit, which they’ve branded Redmond Clay, and decided to make a toothpaste out of it. The better clay to use: White Kaolin. Not only is it a gentler smoother silkier clay, but it cleans and removes stains better. It is the king of CEI (Cleaning Efficiency Index) and is a great gentle polisher as well. Plus it’s white! And yes it’s safe to swallow – ever wonder where the “Kao” in Kaopectate comes from? White Kaolin is remaining the best kept secret in homemade toothpastes, while bentonite seems to be getting all the attention. I think Earthpaste and it’s popularity is largely responsible for this. That is not a knock on Earthpaste – which is actually a great product. Plus, because bentonite is brownish in color people associate it with “earthy”, thus more natural. White Kaolin is just as “natural” as bentonite … it’s just a different color due to it’s mineral and ore composition. For instance, you can get Kaolin that is red/pink, which of course contains more iron than the white variety. Bentonite is definitely a great clay, and has it’s purposes and many uses, as does Kaolin. They are all in the same family of clays. It just so happens that White Kaolin is the most gentle of them all (it’s used in face masks for sensitive skin), plus it’s the best at polishing and removing stains. Simply, it’s a better choice for toothpaste – the world just seems a bit slow to catch on to this discovery (yes there are studies to prove this). We’re obsessed with this more natural looking mud clay, which is natural I guess 🙂 Again, don’t get me wrong, bentonite is a great runner-up! And for anyone thinking of adding water to this recipe to make it more pliable – probably not a good idea. Don’t forget that oil and water don’t mix, without an emulsifier. Now it’s possible this may actually be ok, as clay can act as a natural emulsifier (to bind oil and water). But as soon as water enters the equation, you’re opening the door to bacteria and mold, thus greatly shortening shelf life. Sadly, as much as we all hate commercial toothpastes because of the chemicals, companies usually have reasons for adding in these nasties. Emulsifiers are necessary to get the consistency us consumers want, and preservatives are necessary to keep us safe from bacteria. It’s the cost of buying ready-made products that must endure the trip from factory to store, and subsequent storage time. Another note on the use of Stevia … a better option is to use Xylitol. There’s a reason you’re starting to see it in all sorts of oral products, including gum. It’s actually good for your teeth! It kills off the bacteria that causes plaque and decay. It also immediately induces saliva production, which is necessary to neutralize acids, restore pH and remineralize your teeth. Make a good natural homemade toothpaste, ditch the fluoride, and chew on some Xylitol-only gum throughout the day and after meals, and your healthy mouth will thank you. This great. I enjoyed the comments when i pop in here. Fortunately I am in to coconut toothpaste business and coconut related products.If interested, you could be connected with me via ; laurarhyan@gmail.com. Hi! I tried making this toothpaste yesterday and it tasted so salty! I followed the recipe closely, not sure what I did wrong. Is it supposed to taste this way?? Maybe I need to use less baking soda? Hey Mimi, Yes, it’s supposed to be fairly salty. Thanks for the recipe! 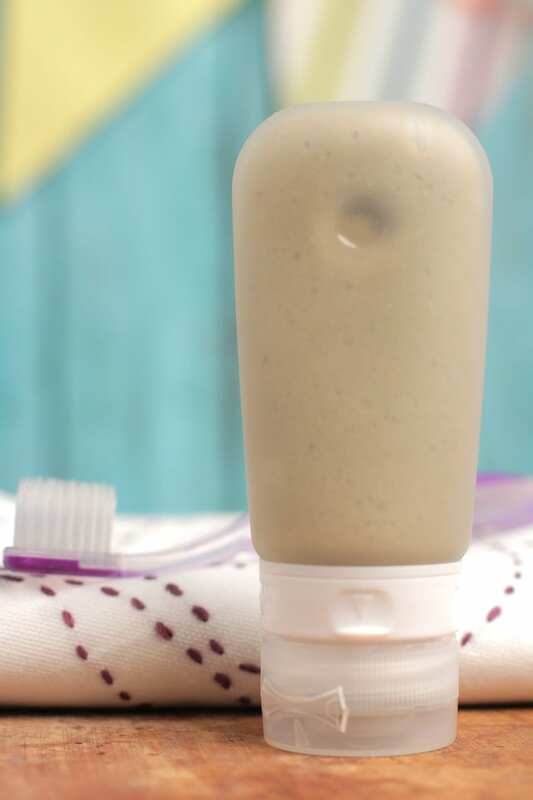 I ditched store bought toothpaste about two years ago, and have tried a few different recipes (all bentonite clay based), and I always go back to this one. I have however made a few modifications; I simply left out the baking soda and the salt because they can be abrasive on teeth (I think the clay and a good scrubbing toothbrush do a good job at this already). It so happens that I went to the dentist just last week, after not having gone for at least a year and a half. Is nervous about telling him about not using a conventional toothpaste. But when i told him that I’ve been making my own toothpaste – though he didn’t let me explain – he said whatever I’m doing is working, and to keep at it; that made me feel confident about my decision to leave out the salt and soda. I found since xylitol at a local Amish market, so I will be adding that to my next batch. 1: You mentioned in a comment that the shelf life is about 6 months. Since salt naturally lengthens shelf life, and I omitted the salt, what would you say is the shelf life without it? 2: The flavor of the essential oils I use in every batch I’ve made and in every recipe I’ve tried – I use a combination of peppermint and orange – fades after only a few days. I know the oils I am using are 100% pure, I’ve never doubted that for the five + years I’ve been buying from this company. I don’t want to add more because I already use a 1% dilution as should be for daily use. So why do you think this happens? 1. I would use it within a couple of months. Maybe even store it in the fridge, just to be safe. 2. Maybe the essential oils evaporate? Maybe make smaller batches, more often, so the essential oils don’t fade. I’ve just made the toothpaste and used the tubes. The paste is too thick to squish out… suggestions? Hey Summer, Is it really cold in your home? That’s probably the issue–the coconut oil oil super solid. You can try running warm water over the tubes, or placing them in a bowl of hot water. See if that helps loosen the toothpaste. Thank you for this post, and the recipe! My son swallows the toothpaste when brushing his teeth and, much like your children, loves the sweet taste so much that he would like to eat it straight from the tube. I buy a good brand (as few decent ingredients as possible) but it is sweetened with xylitol and his doctor said xylitol may be harmful to the gut. (We are in the midst of healing my son’s gut.) I also know that xylitol is used in toothpaste because of its anti-cavity properties. Sooo, finding one without has proved impossible. So, here I am searching the internet for DIY versions, minus the xylitol. I really appreciate you sharing your recipe and your story around the transition.